← Eat, wash up, repeat; eat, wash up, repeat…polar bears do it too! 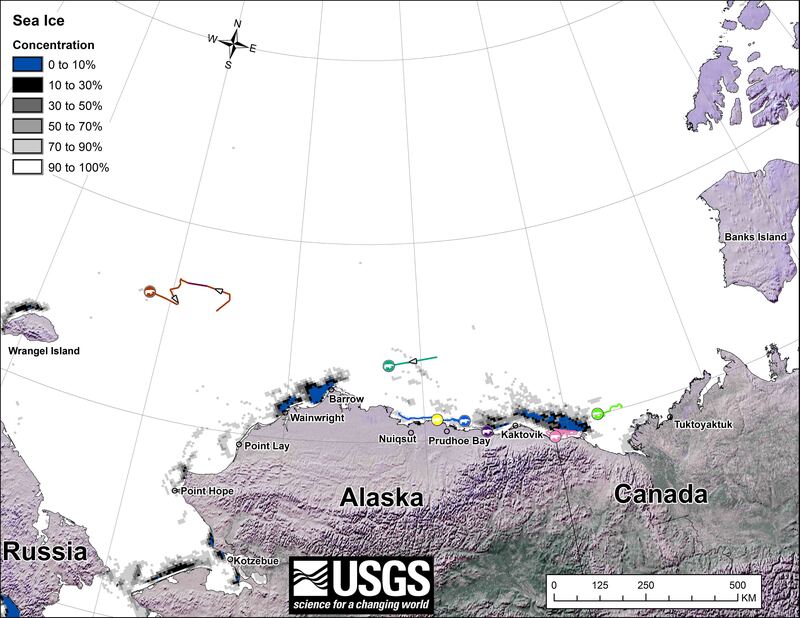 Here is the January 2014 follow-up to my post on the July 2013 track map for female polar bears being followed by satellite in the Beaufort Sea by the US Geological Survey (USGS) – Ten out of ten polar bears being tracked this summer in the Beaufort Sea are on the ice. The USGS track map for January 2014 is copied below (Fig. 1). Both the Southern Beaufort and the Chukchi Sea were completely ice-covered by the end of January. The seven bears tracked during November and December were reduced to five in January — down 50% from the ten bears collared in July. Figure 1. 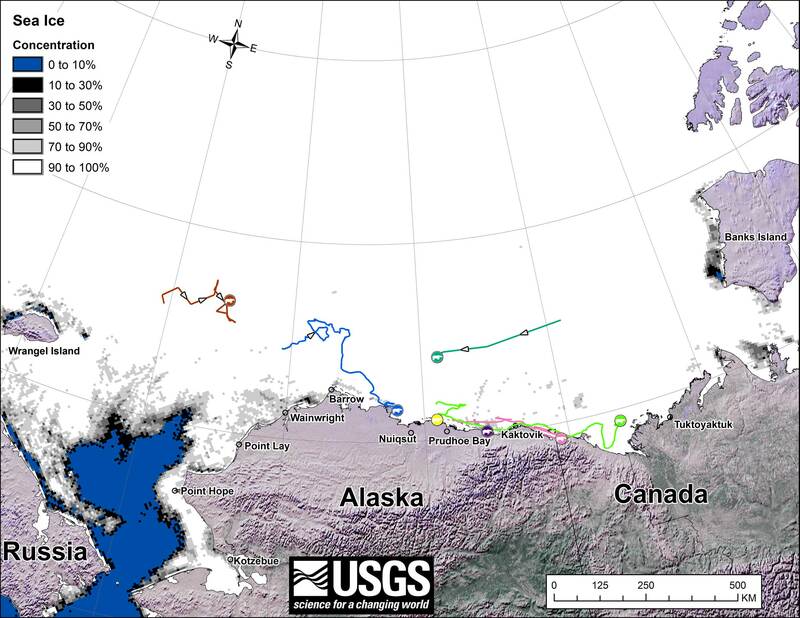 From original caption: “Movements of 5 satellite-tagged polar bears for the month of January, 2014. Polar bears were tagged in 2013 on the spring-time sea ice of the southern Beaufort Sea. All 5 of these bears have satellite collar transmitters.” Note that the dots with the polar bear icons are the end points (end January), while the other end of the string is their position in early January. There were two fewer females present in January than in November and December. Click to enlarge. The female with the dark brown track has moved out of the region — or her collar has stopped transmitting. She was in the Southern Beaufort in early October, moved west to the Chukchi that month, and stayed in the Chukchi during November and December. Maybe she’s still there with a broken transmitter. The female with the teal green track, who was on the September map but disappeared during October and then returned during November and December, has moved into the Chukchi Sea. The track of this bear is a reminder that a signal that disappears from the area isn’t always due to transmission failure. The female (light brown) that was on Banks Island at the end of September but then moved out of the region in October, is still gone — or her collar has stopped transmitting. Two of the four females (yellow and dark purple) that are onshore on the north coast of Alaska, east of Barrow, have not moved since November. It’s probably safe to conclude that these two females were pregnant when collared in July and are now in dens with newborn cubs. Two additional females (royal blue and pink) have been moving around a bit along the coast of Alaska east of Barrow since November (see Figs. 2 and 3 below) – rather more than would be expected, I think, from mothers in maternity dens built on sea ice. The bear with the light green track that was present in December (Fig. 2) has moved out of the area — or her collar has stopped transmitting. Figure 2. Polar bear tracks for the month of December, 2013. Note that the dots with the polar bear icons are the end points (end December), while the other end of the string is their position in early December. The same 7 females were present in November. See the complete December post here. Figure 3. Tracks of 7 females for the month of November, 2013. Note that the dots with the polar bear icons are the end points (end November), while the other end of the string is their position in early November. See the complete November post here. This entry was posted in Life History, Sea ice habitat and tagged Beaufort Sea, Chukchi Sea, polar bear movements, polar bears, satellite collars, sea ice, Southern Beaufort, tracking polar bears, USGS. Bookmark the permalink.